It's 2015 and we're in a mobile-first world. According to Movable Ink's research, about 70% of emails are opened on smartphones and tablet computers. Marketers know that building responsive emails is important, but many don't know where to start. 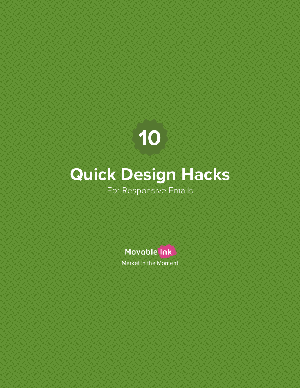 We put together this new guide, "10 Quick Design Hacks for Responsive Emails", to help solve that problem. In this guide, you'll learn simple ways to create great-looking emails for mobile devices and see examples of how brands are making the most of smaller screens.